I was inspired to try this one by looking at Alex Halavais's post Tweeting MiT6 and john maxwell's collection of the #mit6 tweets. With a nice frequency graph, word cloud, and other representations, I thought my graph stuff would be a nice adjunct to the great work these folks have already done. If you haven't read my recent posts on #swineflu, #09ntc, and #mw2009, take a gander at those--I explain most of the terms I'm using here to the best of my admittedly limited ability. I've mostly been interested in hubs and authorities, the two ranked lists of nodes that come out of Jon Kleinberg's HITS algorithm. As I understand it, hubs work a lot like respected reporters and authorities work like respected sources (in journalistic terms, not in graph-theory terms). So, the highest-ranking authority within #mit6 would be someone who is replied to a lot by the highest number of respected reporters and the highest-ranking hub would be a tweeter who has replied to a lot of respected authorities. Interesting stuff. As for hubs, julie levin russo is the highest ranked. She consistently uses the "@" in many of her posts, and, in particular, replies and retweets many of the people on the authorities list. So, top hub. Derek Kompare is the next ranked, and his tweets follow a similar pattern. He's also the third ranked authority, j_l_r is the eighth. Top authority kfitz is also the #6 hub. 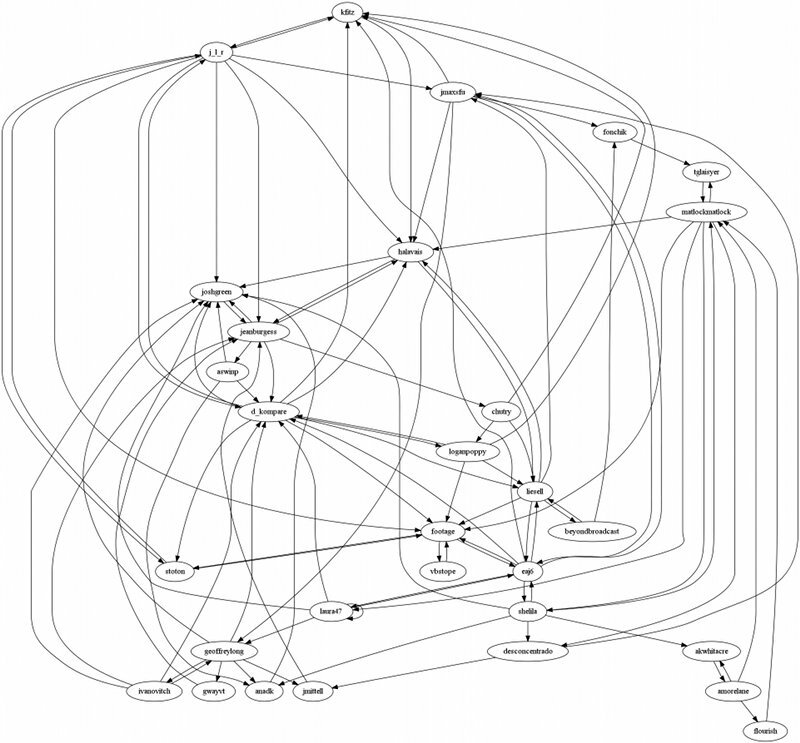 Largest SCC for #MiT6: The subgraph of the largest strongly connected component for Media in Transition 6. All of the "major players" are here--one of the nice things about the SCC and the hubs and authorities is that I've seen that they tend to show the same tweeters. This isn't universally true, though. In #swineflu, the biggest authority, CDC Emergency, didn't appear--because CDC Emergency never replied back to anyone. 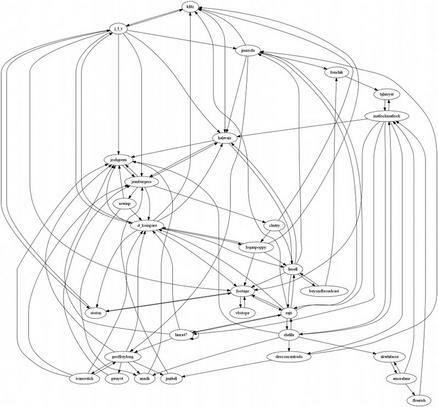 At #mit6, it seems like a lot of people did a good amount of linking back to each other. One note of weirdness: I got a total of 1025, a bit more than the 1009 the other folks reported. Not sure why that is--might need to take a look at my search API scraper.